BOSTON--(BUSINESS WIRE)--PathMaker Neurosystems Inc. (“PathMaker”), a clinical-stage bioelectronic medicine company developing non-invasive systems for the treatment of patients with neuromotor disorders, announced today that it has been awarded a nearly $5 million cooperative agreement from the National Institutes of Health to advance the development of its breakthrough non-invasive device, MyoRegulator™, as a treatment for spasticity secondary to stroke. The 4-year grant has been awarded through the CREATE Devices program that provides a collaborative partnership with the National Institute of Neurological Disorders and Stroke (NINDS). In the U.S. alone, stroke affects over 7.5 million patients, with an estimated 795,000 additional strokes occurring each year. Over 30 percent of stroke survivors develop spasticity, a disorder of muscle tone that can cause striking impairments in functional movement, severely limit motor control, and impact daily activities and quality of life. Management of spasticity is a difficult and sometimes insurmountable challenge. A non-invasive solution would potentially displace the expanding use of injected botulinum neurotoxins, which can be associated with serious adverse effects, painful repeated intramuscular injections and high costs. “The CREATE Devices program encourages the pursuit of translational and clinical studies for innovative therapeutic devices to treat neurological disorders,” said Nick Langhals, Ph.D., Program Director at NINDS. 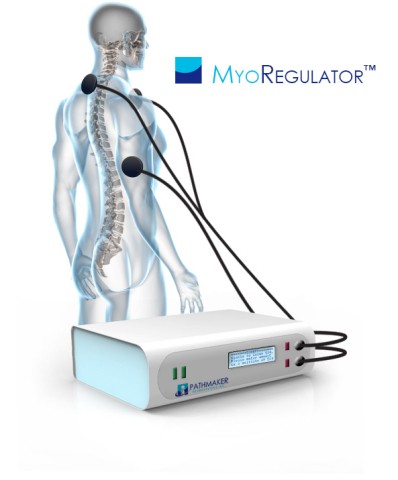 MyoRegulator is a non-invasive neuromodulation device based on our proprietary DoubleStim™ technology, which provides simultaneous non-invasive stimulation at spinal and peripheral sites to durably reduce muscle spasticity. MyoRegulator was one of the first “breakthrough” medical devices selected for the U.S. Food and Drug Administration’s (FDA) Expedited Access Pathway and is now in IRB-approved human clinical trials. The multi-center US trials will be coordinated through a subaward to Northwell Health (formerly North Shore-LIJ Health System) and The Feinstein Institute for Medical Research. MyoRegulator is an investigational device and is limited by United States law to investigational use only. PathMaker awarded a ~ $5 million cooperative agreement from NIH/NINDS for development of MyoRegulator for non-invasive treatment of spasticity.